Berlin is the heart of Germany, with a stoic beat that echoes through grand public buildings, glorious museums and theatres, urbane restaurants, bustling pubs and raucous nightclubs. The Wall is gone but Berlin is still divided: there's a distinct segue from the glitz of the west to shabby East Berlin. Today the city, restored as the nation's capital, is the focus of a mammoth project of reunification and the barometer of Germany's moods. Of strategic importance since it first straddled the Spree River in the 13th century, Berlin went on to hog centre stage in the turbulent twentieth. This area was quickly colonised by the trendy cafe-bar set in the early 1990s and swift rebuilding has erased nearly all trace of the Wall. It's the suburbs of East Berlin with their grey and decaying apartment blocks, cardboard cars and paucity of telephones that make it apparent that the Wall was up to protect a utilitarian East from a decadent West. From the civic turmoil of the Thirty Years War, to the devastating impact of the fire-bombing during WWII, Berlin has constantly been under siege or in a post-siege rebuilding phase. Until it came down, the Wall was the most enduring icon of a nation's disharmony. But it's not as if the city hadn't seen it all before. 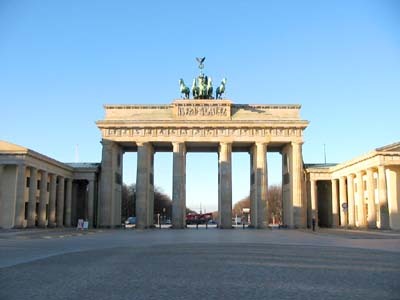 Berlin area has been settled since the Stone Age, but its 'modern' history began in the 13th century with the founding of the trading posts of Berlin and Cölln by itinerant merchants in the area of today's Nikolaiviertel, in the Mitte district. 1432: Berlin and Cölln, which were linked by the Mühlendamm, merged. 1440: Elector Friedrich II of Brandenburg established the rule of the Hohenzollern dynasty, which was to last until Kaiser Wilhelm II's escape from Potsdam in 1918. Berlin's importance increased in 1470, when the elector moved his residence there from Brandenburg and built a palace near the present Marx-Engels-Platz. In the Thirty Years' War Berlin's population was decimated, but in the mid-17th century the city was reborn stronger than before under the so-called Great Elector Friedrich Wilhelm. His vision was the basis of Prussian power, and he sponsored ,seeking asylum and benevolent rule, Jewish and Huguenot refugees . The Great Elector's son, Friedrich I, the first Prussian king, made the fast-growing Berlin his capital, and his daughter-in-law Sophie Charlotte encouraged the development of the arts and sciences and presided over a lively and intellectual court. Friedrich II sought greatness through building and was known for his political and military savvy. In the late 18th century, the Enlightenment arrived with some authority in the form of the playwright Gotthold Ephraim Lessing, and thinker and publisher Friedrich Nicolai; both helped make Berlin a truly international city. 19th century: began with the French occupation of 1806-13, and in 1848 a bourgeois democratic revolution was suppressed, somewhat stifling the political development that had been set in motion by the Enlightenment. Between 1850 and 1870 the population doubled as the Industrial Revolution, spurred on by companies such as Siemens and Borsig, took hold. In 1871 Bismarck, the Prussian Prime Minister, united Germany under Kaiser Wilhelm I. 1900s Population of Berlin was almost two million. On 9 November 1918 Philipp Scheidemann, leader of the Social Democrats, proclaimed the German Republic from a balcony of the Reichstag (parliament) and hours later Karl Liebknecht proclaimed a free Socialist republic from a balcony of the City Palace. Before WWI Berlin had become an industrial giant, but the war and its aftermath led to revolt throughout Germany. 1919: In January, the Berlin Spartacists Liebknecht and Rosa Luxemburg were murdered by remnants of the old imperial army, which entered the city and brought the revolution to a bloody end. In 1932, on the eve of the Nazi takeover, the Communist Party was the strongest single party in 'Red Berlin', having polled 31% of the votes. Large parts of Berlin remained anti-Nazi during the years Hitler was in power. In WWII, the city was heavily bombed by the Allies and, during the 'Battle of Berlin' from August 1943 to March 1944, British bombers hammered the city every night. Most of the buildings you see today along Unter den Linden were reconstructed from the ruins. The Soviets shelled Berlin from the east, and after the last terrible battle buried 18,000 of their own troops. 1945: In August, the Potsdam Conference sealed the fate of the city by finalising plans for each of the victorious powers, the USA, Britain, France and the Soviet Union, to occupy a separate zone. 1948: In June, the city was split in two when the three western Allies introduced a western German currency and established a separate administration in their sectors. The Soviets then blockaded West Berlin, but a massive Allied airlift kept the area supplied and allowed it to resist invasion. 1949: In October, East Berlin became the capital of the GDR. The construction of the Berlin Wall in August 1961 stopped the drain of skilled labour to the West. 1989: On 9 November, the Berlin Wall opened, and on 1 July 1990 the Wall was being hacked to pieces. The Unification Treaty between the two Germanys designated Berlin the official capital of Germany. 1991: In June, the Bundestag voted to move the seat of government from Bonn to Berlin over the next decade. A huge consortium of public and private organisations was charged with constructing the heart of a metropolis from scratch. In April 1999 the revamped Reichstag reopened and hosted the unified Germany's parliament, and Berlin was again officially the capital of Germany. As a result the 1990s saw a ballet of cranes revitalising Potsdamer Platz, with a new urban district anchored by DaimlerCity and the Sony Center (completed in 1998 and 2000 respectively).